Heads turned when Facebook forked out $19 billion for messaging service WhatsApp in February, and eyes popped when Facebook CEO Mark Zuckerberg said it was probably worth even more. Now, analysts over at Crédit Lyonnais Securities Asia have taken up the baton on outsized messaging app valuations: it says that WeChat, a Chinese competitor owned by Tencent, is worth “at least $60 billion,” because of the fact that it has more active revenues streams incorporated into its service than WhatsApp does. CLSA ranges the valuation between $35 billion and $64 billion this year. 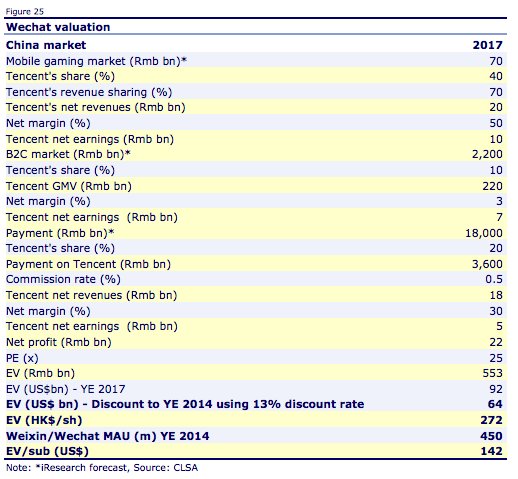 In a bullish research note published today on Tencent (subtitle: “Building an empire”), analysts Elinor Leung and Terry Chen make the case for how WeChat should be worth at least two to three times the value of WhatsApp, which they had previously valued at $35 billion. Although it looks like WeChat has less users — around 300 million today to WhatsApp’s 465 million — it has more revenue streams. It also believes that WeChat is likely to hit 450 million users this year, with each subscriber worth some $142. WhatsApp has been careful in saying that it will continue to build its business under Facebook with the same revenue model in mind — no advertising, and users paying for the service itself. WeChat is not quite in the same boat but it too has taken an more delicate approach to advertising, for now at least. Interestingly, other WeChat services not based on ads point to other areas where you could imagine WhatsApp (and Facebook) also potentially developing additional features. One specific area is payments. Tencent has launched apps to such as red envelope (for “real money” P2P transfers) and taxi apps, which it is also integrating with WeChat. (Users provide bank, credit card or debit card account details to WeChat to register, and then enter a password and verification code (sent by Tencnet via SMS) to complete transactions for things like paying bills, buying things, red envelopes and subscriptions. 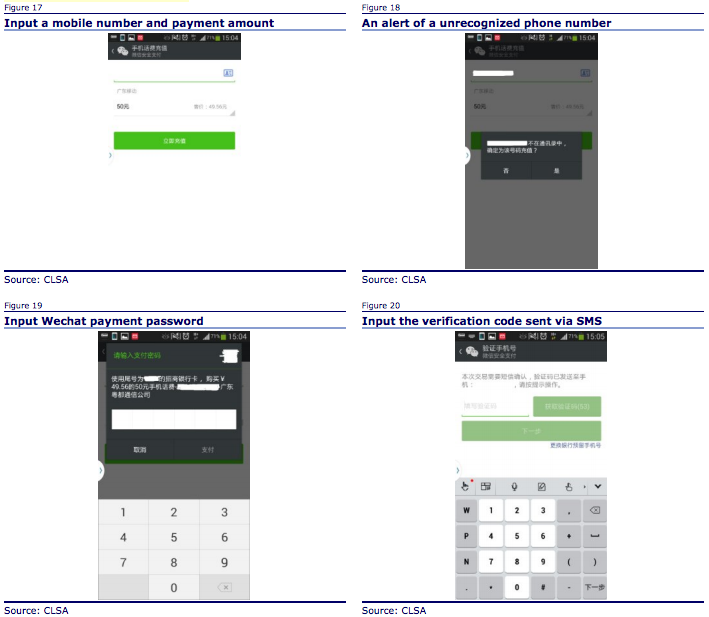 “WeChat payment registered users reportedly jumped 5 times given the viral effect of the red envelope app,” CLSA writes. — Tencent will take 20% of payment market and generate Rmb3bn ($489m) from payments. With that in mind, and considering WeChat’s role in facilitating that ecosystem, they forecast that by 2017 WeChat will be worth $92 billion, and contributing to a higher target for Tencent in general to HK$700/share (it closed trading today up slightly to HK$618).